Homepage. This page: Issued by James E Bullock & Son Ltd of Cheadle. This leather bound pocket diary dates back to 1965, when my grandmother (mum's side) bought a shiny new Morris 1100. Presumably the car also came from this garage, that was situated in Cheadle (Cheshire). This diary was given out compliments of James E. Bullock & Son Ltd, which was located on Cheadle Green - telephone number Gatley 2803/8223. Several marques from across the Nuffield empire were sold by this garage, namely Morris, MG and Riley cars. The company is still in business, and still located in Cheadle, although now they operate coaches rather than sell motorcars. I guess these diaries were made available to BMC car dealers in the 1960s, and could be personalised according to the garage in question. 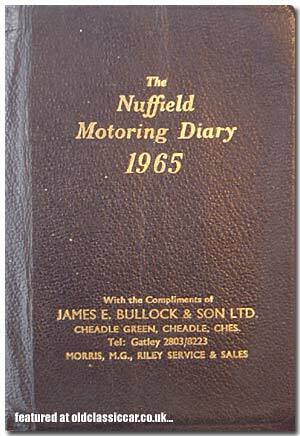 All the usual diary information can be found inside this nice little freebie, but there are also some nice old advertisements, including BP Visco-static Longlife motor oil, Sternol motor oils, Duckhams oils, a plug for BMC Service Limited, Lucas - Britain's best battery, BMC/Kangol seatbelts, and Dunlop tyres. There is also a handy section containing useful info on both old and new BMC cars - eg tyre pressures, plug and tappet gaps, and instructions about the optional seatbelts and underbody seal. Models mentioned include Minis, Minors, Oxfords, Isis, Wolseley 1500, 15/60, 16/60, 6/90, 6/99, 6/110 & Hornet, Riley 2.6 (Pathfinder), 1.8, 4/68 & 4/72, Elf, and MGs such as the MGA (inc twin cam), MGB, Magnette and 1100. Oldies referred to include the RM Rileys, MG Y & YB, MG TD, and TF.